Norway is worried over Russia, and so they should be. Add to that list of worriers, NATO. Russian ships have now docked at the once secret Norwegian naval base in the Arctic. It would seem that Norway has become a strategic chess piece once again in what is shaping up to be the road to World War III. Russia has its massive Northern Fleet based on nearby Kola Peninsula. “We sold the only base worthy of the name that we had up there. It’s pure madness,” former vice admiral Einar Skorgen, who commanded Norway’s northern forces, told AFP. Indeed, it is madness and the Russians have swooped in to take advantage of this lunacy. Skorgen and other critics are now claiming that Norway has robbed itself of a crucial foothold in the far north, forcing its submarines to travel hundreds of extra miles from their bases to defend the region. Lack of foresight on the Norwegians’ behalf has given the Russians a strong foothold in a very militarily important geopolitical area. Now, three Russian military ships have spent the entire winter docked deep within the mountain hideaway, once a closely guarded military facility. “We are the only country along with Russia to have a permanent presence in the Barents Sea, where we share a common border. Obviously our navy should be stationed there, including our submarines,” Skorgen said. “If the ships aren’t there where they are needed, they might as well be scrapped altogether.” He is soooo right on that. Historic blunder does not begin to cover this move. Those ‘research vessels’ are military vessels, you idiots, some of them surely updated and modernized versions of the old “fishing trawlers” that the USSR used to send out to plague our Naval exercises. Only the Russians know what is on those ships and what they are doing, but I’ll go out on a limb here and say it isn’t reading survey maps and taking samples. This is a special kind of stupid. The decision to close the base was made by the leftist government of Jens Stoltenberg, who has gone on to become NATO’s current Secretary General and who has warned countries not to lower their guard when it comes to Russia. Ironic much? So, first Jens, being the good socialist he is, closes the base and enables the sale of it to the Russians, then he warns not to trust the Russians. Yes, he is epically stupid, unless he’s working for the Russians that is. That is altogether possible. Kjell-Ola Kleiven, a blogger writing on security issues in Norway, calls the affair the “biggest blunder in recent history” in an oil-rich country which boasts the world’s largest sovereign wealth fund. Labeling this a ‘blunder’ is being way too kind. “With 7,000 billion kroner in the bank,” he wrote, “you would have thought that the Norwegian nation had the means and savvy to retain ownership of Olavsvern base.” Despite the protests, Norway’s current right-wing government has shown no signs of reversing the decision made by its predecessors. So the conservatives are just as suicidally stupid as the socialists. 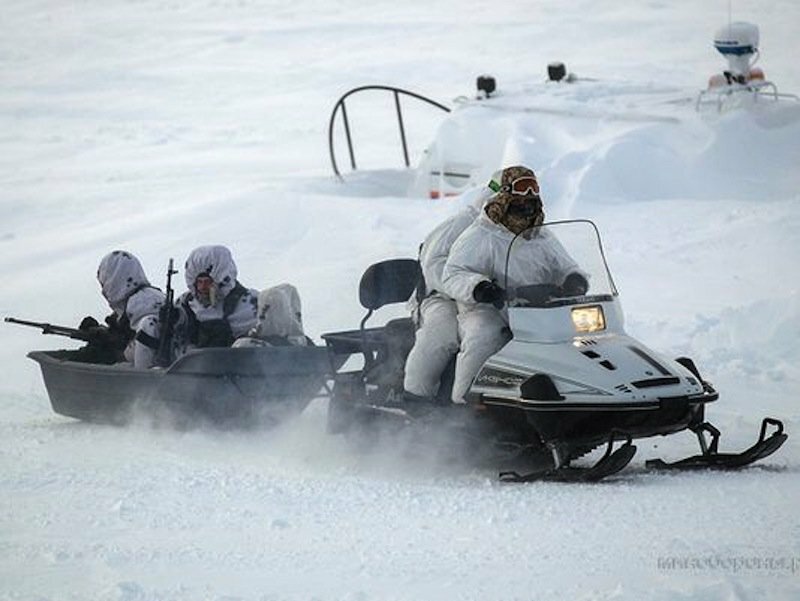 “There are no plans to re-establish military installations in Olavsvern,” Audun Halvorsen, political advisor to the defence minister, told AFP in an email. “The owner of the site can use it as he sees fit and the armed forces do not have the authority to impose restrictions, nor any mandate to monitor civilian ships that dock there,” he added. “Any suspected irregular activity is a matter for the police and legal authorities.” Well, the fallout from World War III is a matter for the world, buddy. And this sounds like something out of Eric Holder’s pie hole concerning police actions versus terrorism. Historically it has been the job of the left to screw things up and the job of the right to make sure those things are not fixed. You’re all in it together and while your military is telling you, “Danger, danger, Will Robinson!” you blithely sell out your military installations and chastise those who object. What a bunch of unbelievably useful idiots. So, what do you do when you bet all of your military capital on the Cold War being over, only to find the Russians were kidding? The Cold War never ended, it shifted. Does everyone out there still think Russia is the world’s savior? Because, if you do, you are in for a huge surprise and it won’t be pleasant. Taking the Arctic benefits Russia in multiple ways. One of them is the vast oil and gas reserves they can claim. It provides a crucially strategic military vantage point. This by the way, further endangers the US and Alaska specifically. Palin was right when she that said you can see Russia from parts of Alaska, and Russia has their scopes on us as well. By the way, the only climate change that the Arctic is experiencing is the Cold War, which is experiencing a bit of a warming curve. Gee, I suppose they’re only going to use those missiles as peaceful paper weights as well. Nothing to worry about at all. The Americans are putting on a show of force in this game of smoke and mirrors, where nothing is what it seems. On April 1, American B-52 bombers trained with allies over the Arctic and the North Sea. Officially, the flights were just a training mission. Unofficially, they’re meant to show Moscow that Washington won’t back down from a fight. Wish I believed that. The US Air Force planned the training missions — nicknamed Polar Growl — for months, yet launched its planes shortly after the Kremlin wrapped up a massive war game in Russia’s frigid northern regions. STRATCOM, which oversees America’s nuclear arsenal, including the flying branch’s heavy bombers, organized the practice sessions. It was a show of strength to reassure our NATO allies and send a message to the Russians. But the growl doesn’t really bare any teeth. And the posturing and game of military chicken continues apace… but it’s pretty clear who has the bigger set here, and who has the “flexibility” going on. In March, Russia tested a new intercontinental ballistic missile. US officials and security analysts say it is a new violation of Moscow’s arms control treaty commitments. Like the Russian bear cares. The March 18th flight test of a new RS-26 missile is part of a large-scale nuclear arms buildup by Russia and is raising concerns about treaty compliance. Moscow is engaged in a major nuclear forces buildup that includes new land-based missiles, new missile submarines and new bombers. Meanwhile, Obama has merrily reduced our nuclear capabilities by a whopping 66%. One does not have to be a mathematical genius to see where that leads. Russia is using Prompt Global Strike as one of its myriad of excuses for upping their air and missile defense capabilities. They claim we may preemptively strike them, which I highly doubt. Obama is much more likely to go golfing with Putin, than bomb him. The PGS initiative aims to deliver a precision-guided conventional weapon airstrike within less than one hour after Washington deems the target to be a national security threat. But since Obama is soooo flexible, that airstrike is not likely to occur under his command. Russia claims that Washington’s PGS has an overall structure similar to that of a nuclear triad. It first of all aims to conduct swift strikes from land and sea using already existing intercontinental and submarine-based ballistic and cruise missiles. Air-launched hypersonic missiles currently in development are a second option the Pentagon is working on. In addition there were hypothetical plans of kinetic bombardments from an orbiting space platform. This gives the Russians cover to work on development and implementation of comparable weapons. To counter the supposed American threat, Russia is developing a new generation of mobile surface-to-air missile system – the S-500 – designed among other things to intercept supersonic targets. While the missile for the system is still under development, once it is completed, it would be capable of intercepting any perspective ballistic and aerodynamic targets. In the Arctic region, Russia has already quickly deployed air defense missile and artillery systems. The Defense Ministry also plans to deploy MiG-31 interceptor aircraft to protect Russian vessels sailing along the Northern Sea Route. They have already placed Pantsir systems in the Arctic. Deployment of MiG-31 on Russia’s Arctic airfields is planned as well. Meanwhile a new fully automatic radar station is undergoing final tests. Imagine a scenario where Russian nuclear subs approach our coastlines completely undetected and launch a barrage of missiles toward our cities and military bases. We could be wiped out before we even knew what hit us. Red Dawn comes to mind. The Russians know this and what is worse… we know it. As far as preparing for a nuclear attack… once again, the Russians have been preparing for decades while we have just ignored the threat. Did you know that the Russians have a massive underground complex in the Ural mountains that has been estimated to be approximately 400 square miles in size? In other words, if true, it is roughly five-to-six times as big as the total area of Washington DC, or roughly the land area inside the DC Beltway. They also have dozens of similar, smaller sites throughout Russia. The Russians have also been constructing thousands of new underground bomb shelters in major cities such as Moscow. In the US, we can’t even fortify our power grid. It’s embarrassing and it’s suicidal in the extreme. According to a Russian think tank, the best way for Russia to solve its problem with America would be to launch a nuclear weapon at Yellowstone National Park and hope it would set off a super volcano, destroying the continent. They are also eying the San Andreas fault. I consider this bluster, but who knows? Surely the Russians know that nuking Yellowstone would almost assuredly not set off the super volcano… in fact, it would probably drain off the caldera. Details. Who says the Russians don’t have a sense of humor? On a more serious note, the Russians are playing both sides of the fence in Europe. From the far right to the radical left, populist parties across Europe are being courted by Russia’s Vladimir Putin who aims to turn them into allies in his anti-EU campaign. The Front National (FN) in France, Syriza in Greece and Jobbik in Hungary may be the most famous ones, but they are far from being alone. Some, like Britain’s UKIP, have disturbingly adopted a “benevolent neutrality” toward Putin. You’ll remember that countries and entities did the same with Adolph Hitler once upon a war. The Kremlin banks on these parties’ accession to power to change Europe and separate it from NATO and the United States, while aligning with Russia. Russia is heating up the Cold War on the road to World War III across the planet and especially in the Arctic. She has some very strange bedfellows as well. The true axis of evil comprises Russia, China and Iran, who all have their missiles aimed at us. I think the Cold War is about to get hot as the Russian bear dons a parka and skis north, to Alaska.